Choosing The Security System That Fits Your Needs | Calgary Alarm Inc. While it can be argued that any home security system is better than no home security system, the truth is that you should select something that specifically meets your needs. After all, the home security system that you ultimately install will play a key role in protecting you, your family and your property from the risks associated with break-ins. What follows are some tips that you can use when it comes to choosing the security system that meets your requirements. Follow these recommendations so that you and yours, not to mention your dwelling, will be safer. You can go with a traditional wired home security system or a modern wireless home security system. Depending on the sorts of features you’re looking for, one type might be more to your liking than the other. One reason you should seriously consider the wireless option is that it is easier to set up and can be installed in some places where it would be impossible to set up a wired solution such as in homes lacking a sufficient network of wiring. Once you figure out exactly what you want, you’ll be in the position to choose whether to go with wired or wireless. You’ll also need to factor in the length of contracts. Some contracts require a long-term commitment with the incentive of a cheaper upfront cost for equipment, while others operate on a month-to-month basis so that you’re not locked in. The amount you pay will be based on various factors, including the type of security solution you choose and the length of time you’re willing to commit to subscribing. Try not to be completely cost-driven when selecting a solution since you don’t want to compromise on safety. 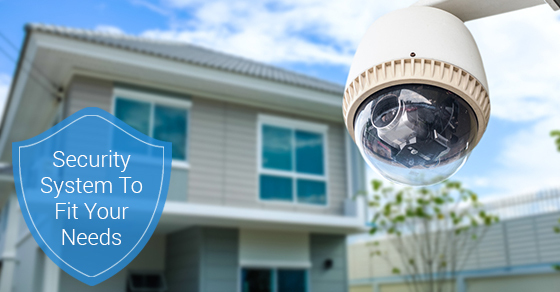 In order to get the most out of your home security system, you need to ensure that it’s customized for your specific needs. So finding a service and technology provider that has a good selection of offerings and features will give you the best opportunity to get a home security system that you’ll find useful. If you have any questions about how to select the right home security system for you and yours, give our team of experts a call today!